Carlos Huerta was one of the first true great stories of the Hurricanes' storied era of dominance in college football. 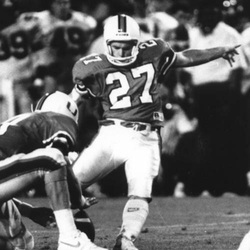 Huerta, the starting kicker on Miami's 1991 National Championship team, emerged as a walk-on and became a consensus All-American and First-Team All-BIG EAST selection. Huerta, who later played with the San Diego Chargers and Chicago Bears, established an NCAA record with his 157 consecutive point after attempts (PATs) during his career as a four-year starter (1988-91). He ranks second on the NCAA's all-time scoring list with 397 career points, including 73 field goals. Additionally, Huerta still holds Miami records for career PATs, career field goals, career points, the top three records for consecutive PATs in a season, the top four records for field goals in a season, the top three records for points scored kicking in a season and field goals in a game. During his four years as a starter Huerta led the team in scoring each season. His foot was a significant reason in historic victories, such as hitting a field goal with 43 seconds remaining to give UM the 31-30 edge over the Michigan Wolverines in Ann Arbor in 1988. Huerta also hit game-winning field goals over Arkansas in 1988 and Michigan State in 1989. A local product out of Christopher Columbus High School, Huerta garnered numerous accolades as a Hurricane, including All-American honors from the Associated Press, Walter Camp Football Foundation, The Football News and The Sporting News. Huerta earned his degree in business and was later inducted into the Iron Arrow society. Following his NFL career, Huerta kept on kicking in the Canadian Football League with the Grey Cup Champion Baltimore Stallions and later in the Arena Football League.